1. Wickfield Blouse in black polysatin with lace at cuffs and edging the attached tie. 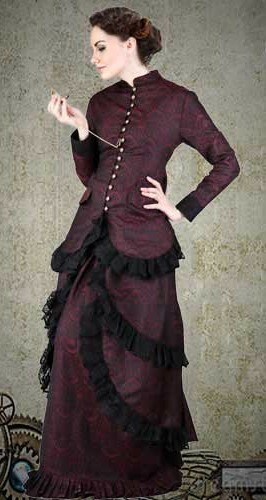 A double row of shiny black buttons down the front adds a touch of Steampunk flair. 2. 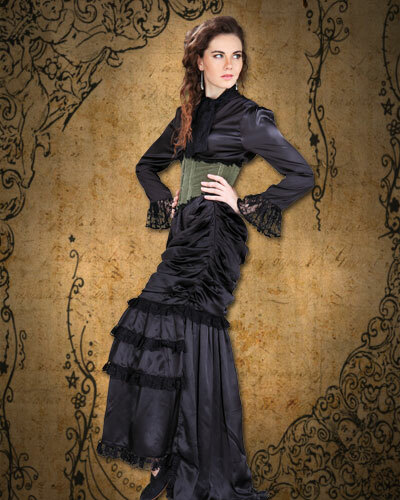 Double-layered skirt in shimmery black polysatin is a luxurious combination of pegged gathers and lace frills. Ruching to the knee creates a graceful draped silhouette that flatters your figure. From knee to hem, a satin train in back adds drama. 3. Marquis underbust corset in moss green velvet, lace edges the top and bottom, black twill lining, eyelet and drawstring lacing in back for a custom fit. Choose all three pieces as an ensemble in one size, or if you need different sized pieces, order the 3 pieces separately below.